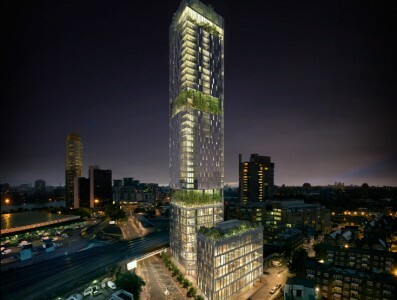 Triangle Fire Systems have been awarded the contract for the design, supply and installation of a BS9251:2014 residential sprinkler system, an EN12845 commercial sprinkler system and the wet and dry rising mains at Vauxhall Sky Gardens. The Mace project is part of the Nine Elms regeneration and consists of a 34 storey tower and an adjacent 7 storey building. Communal gardens will be situated on various levels of the buildings, including a roof top garden which encompasses the entire floor of the tower. The development has been crowned ‘Best Housing Project’ in the Sunday Times Home Awards. Triangle will be providing sprinkler protection to cover all 342 apartments, the gym, the lounge and the foyer areas. Triangle will be working on behalf of Essex Services Group. The development is scheduled to be complete in 2017.